In April, I had a silly problem. I got a key stuck in my roommate's closet door. She was away, and when she came home, she wouldn't be able to access her cupboard full of valuables. Not only that, but it would look like I was trying to break into her closet of valuables, when really I was just trying out spare keys to check which doors they opened. Alas, such pickles I get myself into. I talked to my stand-in "dad", that is, my coworker. He gave me a few tips and ideas to get the key unjammed. A day or two later he asked if I'd resolved the problem yet. Of course, I hadn't. "I assume you've prayed about it, right?" Of course, I hadn't done that either. "OK, well do that first. Then, if you need help, we can come over and try to help..." So we prayed, and they came, and they unjammed the key for me. In May, I had another silly problem. I called my coworker's wife (my office companion) one night because I was trying to make homemade buns for soon-arriving guests. I was flustered and afraid my yeast wasn't going to rise. She gave me remote technical support on the probable condition of the yeast. Then she told me that she prays for her bread to turn out. She prayed for my bread to turn out. And it did. This, my friends, is the story of my life here. These two people that I see practically every day pray a lot, about anything and everything. You seriously cannot spend more than an hour in Coworker 1's presence, without him stopping to pray about something together. He often drops into the office where his wife and I work, and asks if we can pray for five minutes. Sometimes while we're working with no employees in the office, my coworker just prays her thoughts aloud against our neutral gray walls. And when a far-away earthquake shook our office, and our employee was scared, or when another was sick, or another was receiving scary phone calls, my coworker prayed with them. Praying is what my coworkers do. As we've talked about prayer together, I realized that my coworkers don't pray a lot because they are necessarily more spiritual than everyone else I've met. I think they've just learned that praying out loud, and often, is a positive thing in so many ways. It commits your every task and activity to Him. It adds eternal perspective to your conversations and relationships. 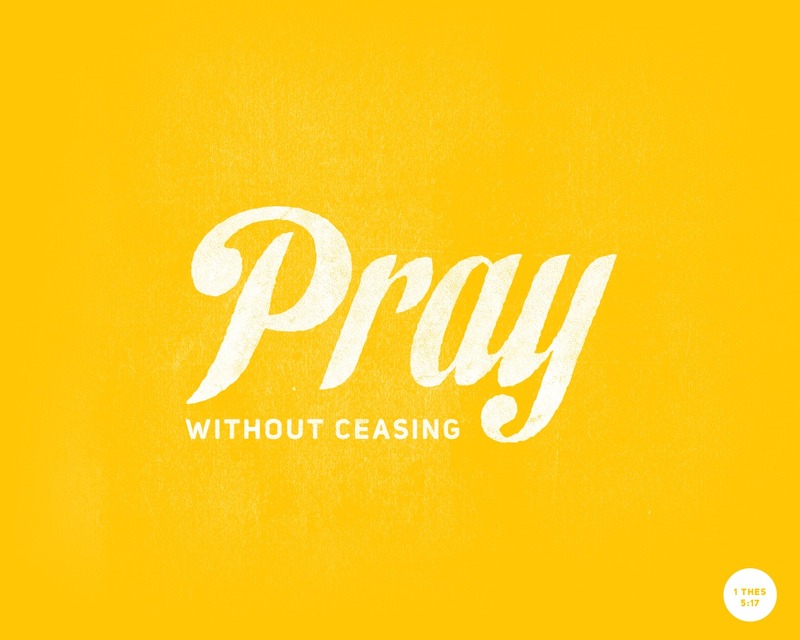 It turns your burdens over to Him; “when we work, we work; but when we pray, God works.” And for three people who sometimes struggle to focus, concentrate and pray by ourselves, praying together helps us to focus on Him. When you're with people who really pray, it's infectious. Some friends here got a new car. They asked us to go down to their parking stall with them and pray over the car. I thought that was neat. So, when I moved into my apartment, I invited the same friends over to pray over my apartment. After they left, my roommate told me, "It's good that you had your friends come pray for our apartment. Even I was thinking of doing something like that, to the god, something with incense sticks...." Our friends here appreciate that we pray with them, and I'm learning to suggest that we pray together, whether it be about their new home purchase, a difficult roommate, or an upcoming arranged marriage. Recently, we've started to hear our employees pray. Simple prayers with no fancy flourishes. Just sincere words that they're learning to give to God (and cute folded hands, since they've noticed my coworker folding her hands). They're learning to tell Him what matters to them. Prayer is contagious. [Prayer] is an expression of submission to God and dependence upon Him. For that matter, prayer is arguably the most objective measurement of our dependence upon God. Think about it this way, the things you pray about are the things you trust God to handle. The things you neglect to pray about are the things you trust you can handle on your own. This Asia move has not been easy for me. There have been days when I've wanted to escape, days when I've cried without being able to pinpoint exactly why. But being in a completely different country and time zone than many of the people I love usually means I must vent first to Him, not them. This has been healthy, to keep my tongue from telling others or my fingers from typing out some desperate email until I've talked to Him. I've never been good at praying. I have tonnes to learn in this regard, and I am thankful to be taught by my coworkers' lives. I find my lack of discipline in this area discouraging. But something recently made me hopeful: I woke up praying to Him. The first thing on my mind was not to check my phone, or confirm the time. I just woke up with my own neediness instantly so heavy on me, that my only thought was to beg Him for help. Asia has been a tool in renewing my realization of my need of Him. And if I realize I need Him, then I will pray to Him, about anything from jammed keys to difficult relationships. He is taking me to where He wants me— and "Lord, it is good for us to be here." Really enjoyed reading your post tonight,specially since we were almost featured in the episode of the slow rising yeast ;) But i have come to learn,as you, that praying without ceasing can mean so many things:a need,a concern, thanksgiving,praise,forgiveness,wisdom,healing,decision making,wanting to know more about Christ, and so much more that we encounter on a day to day basis.Its such a joy and comfort to know then, that i can commune as friend with friend. How convicting! I can't wait to meet your coworkers someday. Probably by the time I do, we will be looking at the One who answers our prayers. The need for Him is something that needs to be recognized wherever we live and in whatever season we find ourselves. Thanks for the challenge and the encouragement that He hears our every need.